What are the Marketing Requirements for Publishing your App on AppSource? » Managerial » What are the Marketing Requirements for Publishing your App on AppSource? Extensions and Business Apps in Microsoft Dynamics 365 Business Central is the hottest topics at the moment. We have published a great article with the tips and steps “How to move to Extensions” in our previous blog post. Microsoft Dynamics 365 Business Central enables you to meet your specific business needs by using prebuilt solutions from Microsoft and their partners that extend the capabilities of Dynamics 365 Business Central when you have unique business processes or industry needs. There is a growing number of different business solutions, published as Business Apps in AppSource. We want to introduce Dynamics Partners about marketing requirements from Microsoft and what we have learned in Directions EMEA 2018 on how to succeed in publishing your App in AppSource and meet all the requirements and how to market your offer best in AppSource. What is the App in Dynamics 365 Business Central? “In order to get an extension to appear on Microsoft’s business application marketplace AppSource, an extension needs to be submitted to Microsoft for approval, upon which it becomes an App on AppSource. Any tenant can install the App, and the owner of the App does not control who can install the App. This model is perfect for add-ons, that are not an embedded solution, but additional functionality that make the base application even better. This is something that is available right now and you can browse AppSource for current and rapidly upcoming Apps (built as Extensions). Some vertical ISVs have published their Apps in this model, since the Embed Apps are not available yet.” , explained Marko Perisic, former Microsoft Genral Manager in his article. English is the only supported language in AppSource to ease the validation process and create a uniform user experience. For you, this means, that both the storefront details of your app and everything that is accessible through it must be in English too. This includes: your app’s landing page, videos, documentation – such as “Learn more” documents, fact sheets, set up instructions, privacy policies, SLAs etc. – as well as help, support and contact options. Creating a website that has two landing pages (i.e. two language buttons – cf. one in English and one in the given local language). In this way your customers can switch to the language they speak and thus easily be able to find the right docs and contact info. However, this set up implies that you need to make two versions of all your docs, support options and landing pages. How to reference the Microsoft brand correctly? Throughout all your sales, communication and marketing materials, all references (spoken and written in videos, docs, app landing page, screenshots, title bars etc.) must refer to the correct branding and UI, either Microsoft Dynamics 365 or Microsoft Dynamics 365 Business Central. Based on the new Microsoft Dynamics 365 branding guidelines, the full name, Microsoft Dynamics 365 or Microsoft Dynamics 365 Business Central, must be used in its entirety at first mention at a page and at all prominent locations such as titles, headings etc. Subsequent mentions can drop “Microsoft” and simply just reference Dynamics 365 or Dynamics 365 Business Central. Please reference Microsoft Dynamics 365 branding rules documentation on Microsoft Collaborate. Don’t include Microsoft names, logos or trademarks in your offer. Don’t use Dynamics 365 names, logos or trademarks in your offering’s: name, URL, your company name, your social media account names or any other names you might use. Don’t make any references in any text, screenshots, title bars, Web client, spoken language in videos, documentation, app landing pages etc. to: o Acronyms: “NAV”, “FOBE” or “D365”, old brands: “for financials”, “for Finance & Operations”, screenshots and demos of old Dynamics 365 UIs Referencing above acronyms, old brand names and old UIs will make your app fail marketing validation promptly. What your offer name will look like on AppSource? The offer name must be the same as the name you specified in the app manifest. How to create a good offer name? There are many things to consider when creating a relevant and enticing name for your offer. How to create a strong app name for your offer (Do’s and don’ts)? Benefit-based names are always more effective than descriptive names. Use industry specific vocabulary or benefit-based references in your product name if possible – this will increase relevance and conversion rates. Don’t use technology specific messaging as your core product name component. Avoid using acronyms that are emotionally meaningless. Don’t include Microsoft names and/or trademarks, such as Dynamics or Dynamics 365 in your offering names, URLs, company names, social media account names or any other names you might use. Does my product name convey anything to my prospect? Does it capture the essence of the product and the value it delivers? Is it appropriate and appealing to our target audience? Is it short? Does the name connect with what our business is about? Is it interesting and memorable? Does it limit us in any way? How easily will it translate into other languages/cultures? Is it too much like another product and will it cause market confusion? How to create a good summary for your offer? The summary is the first paragraph that the prospect reads, as it will appear on your app’s search page. Make sure that it is clear and concise. How to structure your summary? The summary should be max. 25 words or 100 characters including spaces, or less. The summary should summarize the value proposition of your offer in one short and concise sentence. (The value proposition is a statement of the unique benefits your product delivers to the customer. If you need help formulating a positioning statement, try the value proposition generator located here). Consider whether or not is relevant (or valuable) to include your offer name in the summary. Don’t just state the offer name as an attempt to make it more memorable (names rarely give away any clues to the prospect about the value they will receive by starting to use your offer). How to Format and Structure Paragraphs in your Offer Description? Make an elaborate and compelling description that outlines the benefits and usage scenarios of your Dynamics 365 Business Central app. How to structure the paragraphs in your description? Benefits in bullet points paragraph. Closing Call to action paragraph. How to format your description in the Cloud Partner Portal? The description can max. be 3000 characters incl. spaces. Use simple html tags when formatting your description to create structured sections that are easy to get an overview of. The following html tags are allowed: o p, em, ul, li, ol and header tags. Structure your description as small “easily readable” sections with headlines. List vital benefits as bullet points. Engage prospects by speaking directly to them using second person “you” language. To capture (and keep) the interest of the prospects you need to create interest and positive mental acknowledgement from the start. This can be achieved by asking relevant provocative questions that prospects either do not know the answer to or can relate to in the introduction paragraph. How to structure the content in this paragraph? Make a section where you ask provocative questions. Speak to a core pain they are likely experiencing that has a negative measurable impact. The question should stimulate a strong emotional response. How to format this paragraph? Format this section as a headline in itallic. Example: Do you have the right stock on your shelves? Are stock outs costing you customers? And are your procurement decisions relying on basic spreadsheets? Pain is the most compelling motivator of driving prospects to take action. Therefore, it is of the upmost importance that you communicate WHY your prospects need your product through a “pain-based” paragraph that call out the fears that they are facing. Use this paragraph to clearly demonstrate to your prospects that you genuinely understand their industry and unique business problems. Describe the business challenges they are facing now (pain) and the ways their revenue growth, margins, productivity (desire), and so on are being negatively impacted by not taking action now. Most importantly, call out the fears that are likely holding them back. Remind them of the cost (higher risk, lower margins, lost sales) they are experiencing by putting off a decision. In so doing you have a bigger likely hood of getting the messages through to them and enticing them to take action. Format this section as a paragraph. Example: Managing inventory is a delicate balancing act. Carry too little and you lose orders (and customers). Carry too much and you tie up much needed working capital. Carry far too much and you end up discounting, or worse, writing off obsolete products. Likewise, you should also make a paragraph that describes the most important benefits and rewards that your prospects will realize by using your offer. Tell them what they will gain by using your offer. (You do not need to tell them how you do it, just what they will gain. When describing the potential value in specific, measurable business terms you will appeal to both their desire and greed.). Quantify impacts and gains. The more specific and concrete your promise of value is, the better. Abstract concepts such as “more efficiency, more productivity, transform your business” are not emotionally impact or convincing, and they do not compel a prospect to act. Paint a picture of a possible experience that the prospect will immediately desire. Avoid the temptation of simply listing features and app functionality. If you make strong claims in the benefit paragraph, make sure you support them with proof. Example: Our app uses Cortana Intelligence to analyze historical data to predict future demand, so you can base procurement decisions on accurate and reliable forecasts, and help your company avoid lost revenue, optimize shipping costs, discover trends and boost your brand reputation by always delivering on orders. Stop relying on basic spreadsheets that take hours of valuable time to complete. Turn anxiety into proactive control and manage this critical business process in minutes by using Microsoft’s Sales and Inventory Forecast extension. Highlight your offers benefits by listing them as bullet points. Round off your description with a strong “Closing Call to action” paragraph that urges customers to take action in order to realize your offer’s benefits. We recommend that you link to both a button and your offer’s unique app landing page in the closing call to action. Microsoft recommends that this paragraph is less than 200 words or 1,200 characters. Insert your chosen call to action(s). Highlight the action that you want users to take by formatting the wanted action in bold as well as linking to your app’s unique landing page (either through hyperlinking the landing page or including a sentence on “Learn more about us here www.xxxyyyzzz.com”). Example: Click Get it now and start aligning your inventory replenishment with your customer demand like a pro. Your customers and sales team will love you for it. Finally, insert a section in the bottom of your description that clearly states which edition(s) your offer supports (Essentials or Premium edition). Create a header 3 in the html tags and make it bold. Call the header “Supported editions”. Include a sentence that lists the edition(s) that your app supports. Create a header 3 in the html tags and make it bold. • Call the header “Supported countries”. • Include a sentence that lists the countries that your app is available in. This app is available in: Australia, Austria, Belgium, Canada, Denmark, Finland, France, Germany, Iceland, Italy, Mexico, Netherlands, New Zealand, Norway, Spain, Sweden, Switzerland, United Kingdom and United States. Choose the industries that your offer is best aligned to. If your offer relates to multiple industries you can choose a maximum of 2. Choose the categories that your offer caters to max 3. Choose which app type your offer is. In the Cloud Partner Portal, you can choose between the options: Free and Trial. Each of these options will convert to different buttons in the storefront details of your app. Note, Microsoft recommends that you link to both this button and your offer’s unique app landing page in the “Closing call to action” of your app description. Example of the completed industries-, categories and app type fields (cf. point 3,4 and 5) in the “Listing details” section of the Cloud partner portal. You need to provide an URL for a distinct help page where prospects can find different types of online product help. The help page needs to include online documentation that can be used as help. It is a requirement that the help page is written in English. It is a requirement that all docs at the help page are written in English and are formatted as PDF-files. There needs to be a clear distinction between the support and the help site. We require two separate pages (i.e. the link to the support and the help page cannot be the same). Provide an URL for a distinct help page, where prospects can find different types of online product help. The help page needs to include online documentation that can be used as help. Instructions on set up/how to get started. Links to existing videos and documentation. Links to the most frequently asked questions. Example of a help site that is set up according to our best practices: Open Door Technology’s help page. Choose which countries your offer supports. Use the drop down box to choose which countries your offer supports. Example: Australia, Austria, Belgium, Canada, Denmark, Finland, France, Germany, Iceland, Italy, Mexico, Netherlands, New Zealand, Norway, Spain, Sweden, Switzerland, United Kingdom and United States. Choose which languages your offer supports. Check the box with all the languages that your app supports. Note, it is mandatory for your offer to support English. Enter the latest version number of your offer. Enter the date (dd/mm/yyyy) when you expect your app to be released or leave this field blank. 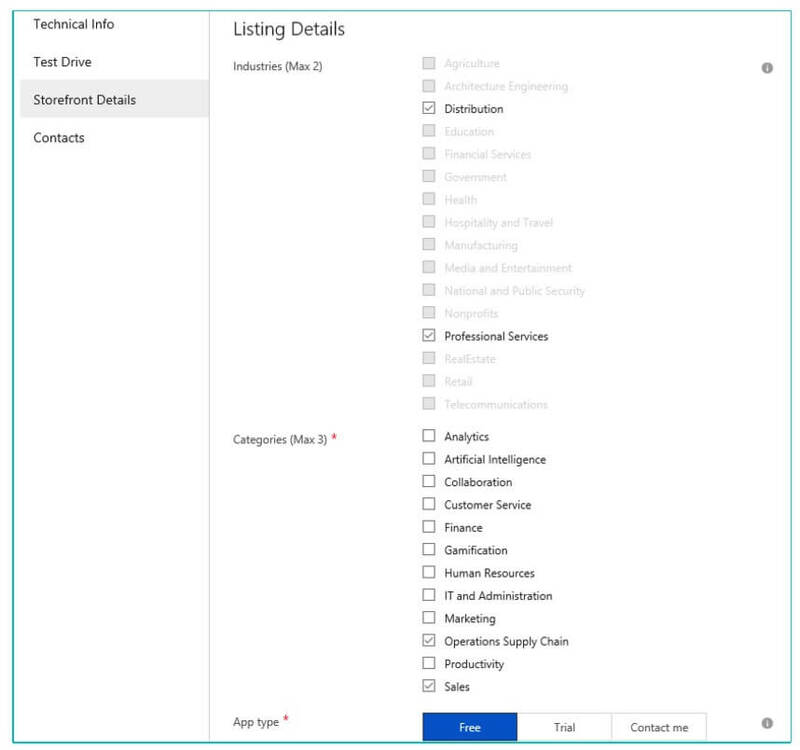 You do not have to select anything – this field is completed automatically because you are developing an app for Dynamics 365 Business Central. Enter a search keyword for your app (max. 3). Enter a secret key that you’ll use to preview your offer in AppSource before going live. Note, this isn’t a password and can only contain alphanumeric characters. 48×48 pixels resolution .png image for your app’s search page. 216×216 pixels resolution .png image for your app’s details page. Your logo should be designed and optimized for a digital medium, not a traditional print based logo. Monitors emit light and paper absorbs light. Make sure you change the format, as you don’t want to end up with weird, inaccurate color representation. All colors can be achieved by merging RGB (red, green, and blue) light, but monitors display only a limited range of the visible spectrum at a low medium resolution, usually 72-75 dots per inch. Print production usually requires a four-color process CMYK (cyan, magenta, yellow, black) in high resolution of at least 300 dpi. Using videos that demo your offer are therefore ideal to create interest and enable prospects to learn more about your offer quickly. On AppSource videos will play when customers select the associated video thumbnail on your app’s details page. A minimum of one video is recommended (up to a maximum of 5 are permitted). Note, videos made in local language must have subtitles in English. Only include screenshots & demo of the newest UI. Reference Microsoft’s brand names correctly: Only refer to Microsoft Dynamics 365 or Microsoft Dynamics 365 Business Central. Don’t make references to acronyms, old Dynamics 365 brand names/logos or demo old UIs. Don’t include logos or trademarks in your video. How to upload video(s) to the Cloud Partner Portal? A name for your video (cf. customers will see this name on your app’s details page). The video URL must be either a YouTube or Vimeo link that is able to be played using an embedded experience. Upload only a .png image with resolution 1280×720. Don’t add a ‘Play’ icon to the thumbnail; this will be added automatically in AppSource. Note, on AppSource videos will play when customers select the associated video thumbnail on your app’s details page. Enable prospects to learn more about your offer by adding supporting sales and marketing assets in the “learn more” section of the storefront details. A minimum of one document is required (up to a maximum of 3 are permitted). It is a requirement that all docs are written in English and are formatted as PDF-files. Microsoft recommends to add the link to your app landing page to all your documents. A name for your document (cf. customers will see this name on your app’s details page). Upload the doc you want to include in your storefront details . AppSource customers are required to accept these terms before they can try your app. It is a requirement that the support page is written in English. It is a requirement that you provide different (i.e. more than two) contact options on your app landing page. There needs to be a clear distinction between the support and the help site. Microsoft requires two separate pages (i.e. the link to the support and the help page cannot be the same). You need to provide an URL for a distinct support page where prospects can find different contact options. Defined service level agreements (SLAs). Select the system (from the drop down menu) where your leads will be stored. Learn how to connect your CRM system here. You forgot to press Publish button. Click ‘Go Live’ button to start the validation process in the cloud partner portal. You didn’t put in the right countries. Check the availability of country support. You didn’t follow branding guidelines. Check the branding guidelines. You confuse help and support. Support and help are two different pages. You are not clear on business value. Rewrite the business value description. There are many technical and marketing requirements you need to meet before publishing your App on AppSource. Simplanova offers our Dynamics Partners Add-on migration to AppSource. If you need Add-on upgrade to extensions, extension / AL development services, extension training course, leave your contact details and our team will contact you.